I’ve been really encouraged and blessed by the kind words people have shared about yesterday’s blog post. I’m glad we’re in this journey together, friends. Let’s keep going. Today I am remembering a conversation with Roxanne during Holy Week last year, shortly after the Doctor’s appointment that told her to “get her affairs in order.” She called me at work to talk. Now it should be said here that Roxanne and I talked on the phone a LOT. There were times I got off the phone and realized we had talked for two hours, and barely with a pause to breathe the whole time. With her living so far away, a lot of our relationship happened over the phone – but every conversation felt like we were sitting and talking over a cup of coffee. This phone call was different. First of all, we hadn’t been having very long conversations in the few weeks prior to this because the treatment she had tried was making her feel so miserable. So it was nice to have a conversation and hear her at a moment when she was actually feeling (in her words) “not too bad.” We talked about what the doctors had said. I told her I was sorry. She said “Well, there it is.” And then we talked about her funeral. Funny enough this wasn’t the first conversation we’d had about this. Roxanne had battled cancer for eight years, and through the years when there bad seasons with her health she would often give me little “funeral tidbits,” such as “I would want Barb Pritchett to do my funeral.” “I’ll remember,” I would tell her. “I would like the song ‘In Christ Alone.’” “I’ll remember,” I would tell her. And she had said to me “I’d want you to do my eulogy.” “I would love to,” I would say. I had started to write here “I don’t know why she told me these things,” but that’s not true. She told me because she knew I would remember when the time came. And I think it also had something to do with the whole minister thing, which meant that I didn’t freak out when she mentioned her funeral. I’m kind of used to funeral talk. So in this phone call we had another funeral talk, but it was different this time, because it wasn’t just an idea anymore. This was the real thing. She told me “I want you to do my eulogy, and I want it to be fun.” I laughed and agreed. “Roxanne,” I said jokingly, “I promise I will show right off.” (This is an old joke in our family, a joke we’d make when we wanted to tell someone to do well – “Go show right off!” we would say. I’m pretty sure this originated with my mother). Roxanne laughed. “That’s great,” she said. “Make sure you show right off.” And we laughed some more. It was actually a pretty light-hearted conversation.” I told her the songs that I knew she wanted. “You remembered,” she said. “Of course,” I told her. Then I got off the phone and thought “I am going to do my sister’s eulogy soon.” It was a lot to take in. This week I realized something interesting – that was the last phone conversation I ever had with Roxanne. The last one. Yes, once or twice in the weeks to come she would get on the phone and say hello for a second or two, but she was never well enough again for one of our marathon phone calls. The last time we talked on the phone we talked about her eulogy. We talked about preparing to die. And we laughed and laughed. I read this, and I think about Jesus accepting – walking towards – the story that was to come. And so, in the midst of grief I will get prepared for joy. I have begun. This is what I bought at the store last night, which we will use in our worship service this Sunday (and for any of you worried about our allergy policy, no, we will not open the Peanut Butter Cups!). Now, when I find myself counting chocolate bars by the fifties, how can I not start to get excited? Sunday’s coming! And there is chocolate. Then I came from the store to our Board meeting at our house, and Phyllis Kokoski brought Easter eggs. I LOVE HER. 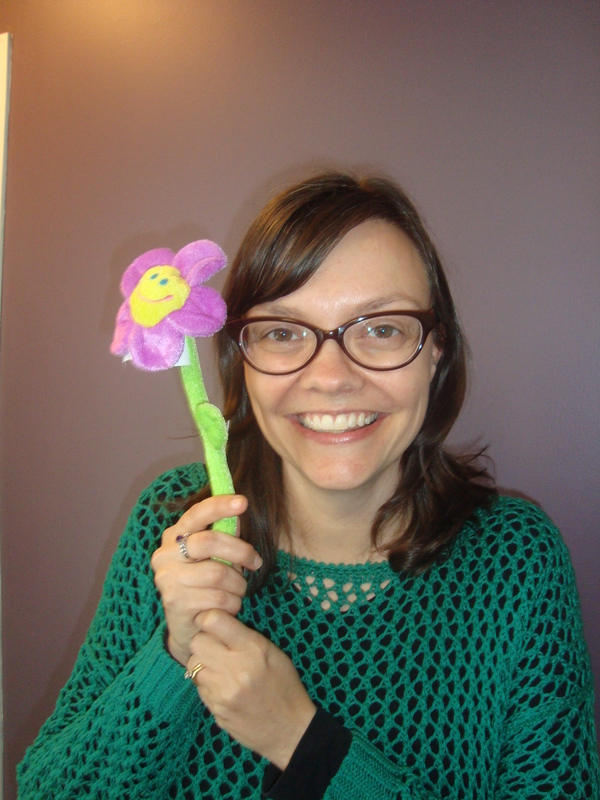 Then she said “I read your blog today” – and handed me a flower. Oh, the joy is coming, too. Thank you Leanne for your very personal Holy Week Meditations. Thanks for sharing just a bit of your feelings as you walked “through the valley of the shadow of death”. For me in all the events of Holy Week two stand out which I find especially difficult to comprehend. The first one is the prayer of Jesus in Gethsemane and the second are the words of Jesus from the cross “Eli, Eli, lama sabachthani”. “My God, my God,why have you forsaken me?” Martin Luther said this about these words, “God forsaken of God! Who can understand it?” I do not understand it; I cannot explain it, but this I know, His death on Calvary bought my salvation, and for this I am eternally grateful. Because of His victory we can walk through the valley of the shadow of death. So true, Nathan. There is great mystery here. Thanks for your thoughts.